Glyphosate, a component of the popular herbicide commonly known as Roundup in the United States, has been placed on California's Proposition 65 list, which requires a cancer warning label on it, despite the fact no regulatory body can find evidence it harms anyone or anything other than what it is supposed to harm, much less that it causes any cancer. Why is a system designed to protect California citizens getting a simple health issue so wrong? The short answer is that the state of California abdicated its ability to regulate products when Proposition 65 was passed by voter referendum in 1986; appearing in an International Agency for Research on Cancer (IARC) monograph as a possible carcinogen is one of the four ways that a product must automatically be added and the legislature can't do anything about it. That's the downside to populism, though environmental groups and the lawyers and lobbyists they hired to make sure this got passed cheered then, and they are cheering now, because this populism opens the door to more lawsuits and settlements for them. Yet in 1986 an IARC classification was at least meaningful, so Californians were not crazy, it was just putting the cart before the horse a little. As John Higginson, the first director of IARC and former trustee of the American Council on Science and Health, noted often, the job of IARC was simply to identify hazards for further study. Exposure needed, and therefore the actual risk of cancer, would be handled by others. Being on a list without noting the exposure needed - especially when 1 dose is equal to 10,000 doses, five orders of magnitude, in those broad IARC classifications - could lead to malicious efforts at scaremongering by environmental groups, critics of Prop 65 warned. Boy, were they right. What they did not foresee was that the environmental groups would win from inside IARC itself. When I give talks in front of audiences about science, I often joke about conspiracy beliefs promoted by anti-science groups like Center for Biological Diversity about the science and health community. In reality, we are not helping each other, much less conspiring with each other for the benefit of industry, we are instead a loose confederation of pro-science anarchists. The really organized long game is played by environmental groups; they truly help each other. And they ask to be rewarded by getting jobs as government insiders. Count the employees from Union of Concerned Scientists and other groups who got jobs in the Obama administration after successfully waging war against Republicans in 2000, 2004, 2008 and 2012 - they use that prestige when recruiting. By contrast, most scientists, and right-of-center people, don't want to work in government at all. Environmentalists have successfully manipulated IARC using that same strategy. In 1986, when Prop 65 was passed, IARC was a world-class organization, that is why it was an honor to have the first director of IARC on our Board of Trustees.Today, IARC has run out of carcinogens to study so they have taken to inventing them - bacon, glyphosate, hot water, you name it. Environmentalists have gamed the system, and they did it by creating a community where no one will debunk the claims made by other activists. They used the following three methods to gain insidious control of an entire United Nations group. Method 1. Declaring that the only conflicts of interest are "industry" funding. I have good news for academics. Industry wants your help, even though they already employ plenty of scientists and are responsible for nearly 70 percent of American spending on research and development. That's also bad news for some academics. If you have never been asked to consult or be on a panel, and you are in any kind of applied field, you are just not very good at your job. Sorry, I know that stings, enjoy those government grants anyway, you can still always get on an IARC panel. Because activists manipulated IARC that way. Eliminating the best scientists, the ones most likely to balk at breezy epidemiological glossing over of biology and toxicology, those who were esteemed enough to get paid to consult, was always part of the plan for activists. A biostatistician named Chris Portier has an extensive resume advocating beliefs like that cell phones cause cancer and Agent Orange caused, well, everything, even though biologists and toxicologists, actual experts, can't find evidence. Armed with National Institute of Environmental Health Sciences experience, which caused that group to abandon toxicology and biology in favor of Portier's preferred epidemiological correlation, he quickly rose through the ranks at IARC, and when given the chance he engineered a rules change stating that if you have consulted for industry you can not be part of a Working Group at IARC. The italics are important. If you happen to be paid by an environmental group, you are fine, but if a company has even paid for your airfare to be on a panel, or paid for donuts at the breakfast before your university talk, you are banned from IARC participation. Who was being paid by Environmental Defense Fund while he was convincing IARC colleagues, those left over after he made sure the best scientists could no longer participate, to have glyphosate declared a carcinogen? Chris Portier. Who never disclosed that obvious Conflict of Interest? Chris Portier. Method 2. Believing that the only conflicts of interest are financial. Imagine you spend your whole career studying Biology X in the belief that Environmental Effect Y caused it. Are you a neutral scientist? No, clearly you have a conflict of interest. Yet it need not be disclosed, you can instead be considered an expert at the United Nations. In an article a few years ago I exposed an academic who claimed that non-organic pesticides were linked to autism. She did not disclose that she was a high-level member of both an autism advocacy group and a chemical activism group. She did not have to disclose those, because they were not industry groups. The journal only considered conflicts to be financial. The paper was rubbish, they used a proxy because actual measurements meant too much work. No one seriously now claims being next to a farm causes autism after I debunked it, yet that paper is still cited by anti-science groups today. If the rules on conflicts were not geared to be anti-corporation, the paper would have never have gotten to "peer" review much less been printed. Method 3. Putting hand-picked scientists on committees. In the case of Prop 65, being in an IARC monograph is just one of four ways to get on the list. There are two special California committees that can include a compound and "committee members are appointed by the Governor and are designated as the "State's Qualified Experts"". We are talking about California and Governor Jerry Brown, arguably the most anti-science governor in the most anti-science state in the country, even though it is so reliant on agricultural science. Is such a governor going to pick a scientist with real-world expertise? No, he is going to pick scientists who already match his beliefs. So what does the Prop 65 glyphosate label really mean? The lawsuits will be great for Andrew Kimbrell's mortgage payments, and Organic Consumers Association will write checks to its 300 "astroturf" food groups as a reward, but is the public going to be any safer? No, for obvious reasons. First, is because glyphosate is less toxic than caffeine or Tylenol, it's even less harmful than BPA, but second is because Californians have become jaded to the ubiquitous stickers by now, they are in every coffee shop, dry cleaning store, you name it. They are even in hospital oncology wards, the one place we know people already have cancer. 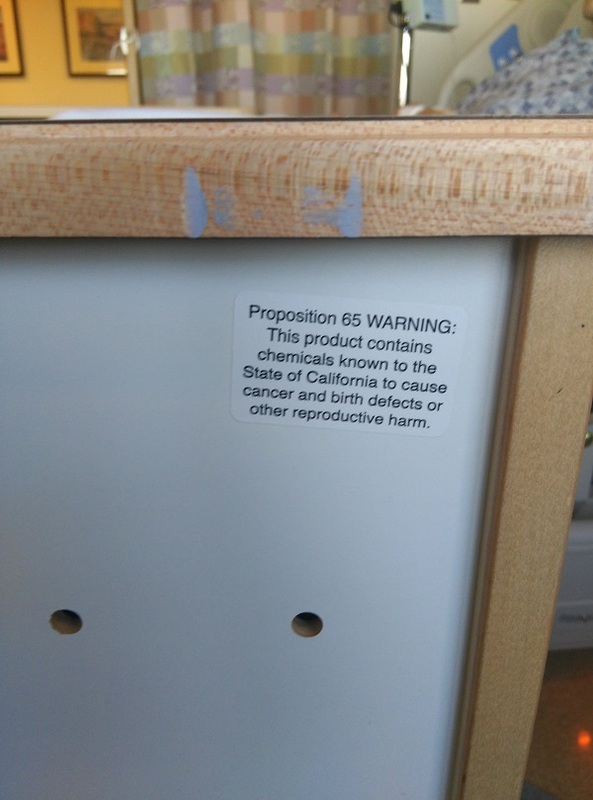 Prop 65 is a running joke. Credit: An ACSH donor and oncologist in California who wishes to remain anonymous because they know it is not the hospital's fault we are all forced to endure this silliness. So it is not going to improve the lives of anyone except lawyers. In 2014, lawsuits under Prop 65 resulted in $29 million in judgments and $21 million of that went to attorneys. Since 1986, that number is over $500 million. Hank Campbell is the President of the American Council on Science and Health, a pro-science consumer advocacy group in New York City, and is the founder of Science 2.0. He does not receive any funding from Big Glyphosate.